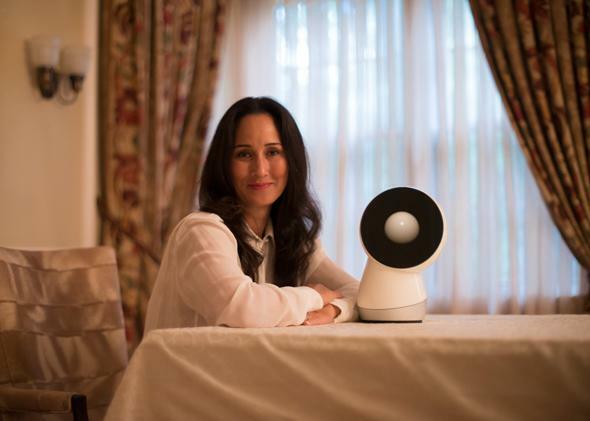 Social robotics expert Cynthia Breazeal debuts Jibo, a family robot. This Social Robot Is Adorable. But Will Families Actually Want One? Cynthia Breazeal with Jibo, the family robot. There are two Jibos in the hotel room where I meet Cynthia Breazeal. One is a display model that doesn’t turn on, and the other is a working prototype. At one point while we’re talking the Jibo prototype hears his name from across the room and comes to life. And it’s not hard to imagine that this is the robot butler, robot sidekick, robot companion of the near future. On Wednesday Jibo announced a crowdfunding campaign run from the company’s own website that offers consumer Jibos for $499 and developer Jibos for $599. The device uses Wi-Fi (mobile data will probably come later) to sync with a Jibo app and pull events, reminders, notifications, and preferences. Currently Jibo’s functionality is somewhat limited, but the developer Jibo from the crowdfunding campaign provides access to Jibo’s software development kit so people can build out features like Google Calendar sync or gesture recognition and put them in the Jibo Store. Breazeal imagines Jibo as a coordinator for a family where some members have mobile devices, but others are too young for them. A 9-year-old playing at home, for example, can ask Jibo to send a message to her dad reminding him about her school play. And dad can dictate a shopping list to Jibo so mom can pick up the right groceries on her way home. Breazeal’s goal is to make an assistant, not a one-use device, which will be crucial to how widely Jibo can be adopted. Jibo’s voice is friendly and youthful, and the robot’s design uses three axes to allow for smooth, quiet 360-degree motions. The device weighs six pounds and is about 11 inches tall. It sits on charging platters and has a battery that can last 30 to 45 minutes (Breazeal says another long-term goal, as with most devices, is increasing battery life). Jibo’s physicality is disarming. Its movements evoke human shoulder positions that express innocent traits like curiosity, attentiveness, and interest (much like a Pixar lamp). But Jibo’s charm is also slightly unnerving. The device is supposed to use things like facial recognition and ambient sensors to analyze who is in a room and what’s going on. When Jibo is in rest position, its cameras face down, and it can be turned on and off. If you want some private, robot-free time, it can also be put in a sleep mode where it is passively listening for a wake-up phrase and won’t respond to anything else. You can’t help but think, though, that there are just so many ways this thing could be plotting against you while you’re sleeping. What if someone hacked it and controlled it remotely? What if it wasn’t only passively listening for a wake-up phrase, but recording everything going on? (Cough, cough, NSA.) Breazeal says privacy is a core pillar of the company’s overall approach and notes that Jibo’s cloud architect has years of prior experience from the IT security company Symantec, which is known for its antivirus products. “[Privacy] is huge when you bring something into your home. As we build out the technology platforms, best practices are being baked in at every level.” But Jibo’s privacy measures don’t sound particularly intense compared to those on a standard consumer smartphone or tablet. So why is Jibo a boy? “When you do robot design, you can try to make robots gender ambiguous, but it’s fascinating that people pick up on cues and assign gender,” Breazeal said. “Male voices when you talk about information tend to be held to be more credible.” But down the line Breazeal says that there could be many Jibo personas to choose from (like the Ultrahouse smarthome system the Simpsons install that has multiple persona options—including Marge’s choice, Pierce Brosnan). At $500, a Jibo is about the same price as an iPad, so it’s certainly something that could sell. And with companies scrambling to definitively unify smarthome products and interfaces, Jibo could be debuting at just the right moment. Plus, according to Breazeal, people are lonely and starved for attention, whether it be human or electronic. Nice work, humans. You’re so starved for connection that you’re talking to a $500 beeping lamp.